In 1930, W.E.B. Sinkins, concerned about the ever-increasing volume of legal titles being published, decided to start a card index system to catalogue new titles received. This index gradually grew and was expanded to include all the books published on English, Scottish and Irish law that crossed his lectern. Needless to say, this passion for cataloguing continued and eventually the only necessary criteria for inclusion were that the title should be written in English and be on the subject of law. W.E.B. Sinkins continued his work for 65 years until he retired in 1995. During the 1970’s, half a drawer of records a month was sent upon request to the Bodleian Law Library in Oxford, to assist in their cataloguing of early law books. W.E.B.‘s legacy to the company was to leave a database that is unique: a card index system of 86 drawers, containing approximately 65,000 record cards, listing law books published from the year 1500 to the present day. Visitors to our Lincoln’s Inn branch are welcome to view these records. The work he began continues even today. Marshall Hall, F.E. Smith, Edward Carson and Rufus Issacs. These men, and others such as John Simon, Henry Duke and Willie Matthews belonged to the golden age of Advocacy at the beginning of the 20th century when any newspaper reader could have reeled off the names of half a dozen forensic luminaries. They were public figures, whose appearances in court were followed with close, even critical interest. They were in the line that links the illustrious Erskine with Patrick Hastings and Norman Birkett, last of the great advocates. Seddon, the poisoner might have escaped the gallows but for the skill in prosecution of Rufus Issacs, and the persistence and persuasion of Edward Carson meant Cadet Archer-Shee (the ‘Winslow Boy’) was able to clear his name. Harold Greenwood was acquitted on the charge of murdering his wife by the oratorical skills of Marshall Hall, the great defender. F.E.Smith youngest K.C. at the bar, rose to become, as Lord Birkenhead, the youngest Lord Chancellor to occupy the Woolsack. 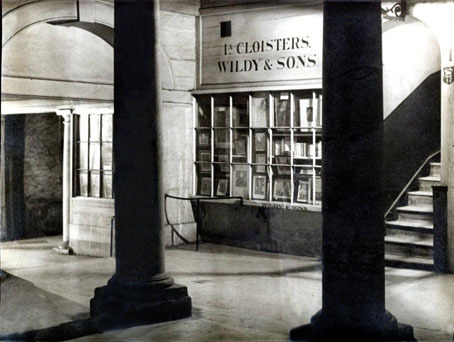 The ‘Great National Theatre at the Old Bailey’ no longer held its former interest with a public devoted to film stars and radio celebrities, and a change came over the courts as law became more of a business. Precise well-regulated legal proceedings are, perhaps inimical to advocacy on the old grand scale. 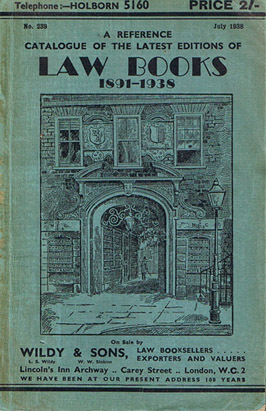 From time to time however a trial did capture the public’s imagination as of old, such as the ‘Lady Chatterley’s Lover’ trial in 1960 and the Stephen Ward trial in 1963, prosecuted by Mervyn Griffith-Jones in both cases, and defended by Gerald Gardiner, Jeremy Hutchinson and Richard du Cann in the case of Lady Chatterley, and James Burge in the case of Stephen Ward (Burge was later said to be the basis for John Mortimer’s character Rumpole of the Bailey). 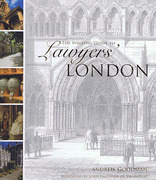 Today’s Legal practitioners are inundated with ‘how to’ and ‘how I did it’ books about Advocacy from all corners of the English speaking world, and although not as glamorous as many of those from the past, they too seek to guide the novice as well as remind the experienced orator of the myriad forms of Advocacy today. 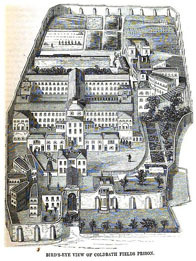 Coldbath Fields Prison, Clerkenwell: Built in 1794 on the site of a cold spring discovered a hundred years before, this prison was notorious for the severity of its regime. Many prisoners were short term inmates and 10,000 petty thieves, drunks and vagrants passed through its walls every year. The jails most famous inmates were the Cato Street conspirators who were later moved to the Tower before being hanged at Newgate. The prison was demolished in 1889. Fleet Marriages: Between 1617 and 1753 a legal loophole meant that on-the-spot marriages could be carried out in an area surrounding the Fleet Debtors’ Prison known as the ‘Liberties of the Fleet.’ Many of the pubs nearby bore the sign of a happy couple holding hands alongside a caption ‘Marriages Performed Within.’ Almost 250,000 marriages took place in the sixty years up to 1753. The area was famed for debauchery and where the rule of law was restricted. Lord Hardwicke led a campaign to end the ‘Liberties’ which resulted in the passing of the Marriage Act of 1753. Lincoln’s Inn Fields Theatre: Opened on Portugal Street in 1660 by Sir William d’Avenant. The first modern theatre in England with both a proscenium arch and moveable scenery. Samuel Pepys was a frequent visitor in the 1660’s. The theatre was closed in 1674 and became a Real Tennis court until 1695 when once again it was used as a theatre. After ten more years it once again fell into disrepair until taken over by Christopher Rich, a lawyer, and his son. They renovated the building and installed seating for 1400 and staged the John Gay’s The Beggar’s Opera the most successful play of the century , based loosely on the lives of Jack Sheppard and Jonathan Wilde the most infamous criminals of the time. 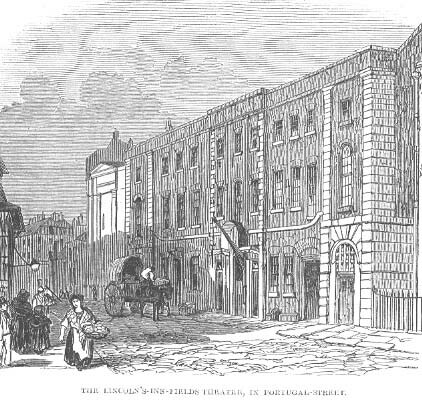 The building was finally demolished after 1794 to make way for an extension of the Royal College of Surgeons. Pillory: In the past, dairymen ‘selling mingled butter’ were ‘sharply corrected’ upon the pillory. So also were ‘fraudulent corn, coal and cattle dealers, cutters of purses, sellers of sham gold rings, keepers of infamous houses, and forgers of letters, bonds and deeds’. The medieval punishment of standing in the pillory saw the culprit strapped into a wooden contraption as the good folk of the town hurled abuse, rotten fruit and often much worse at the offender. The principal location of London’s pillories were Cheapside, Cornhill, Old Bailey, Palace Yard and Charing Cross. Many lost their lives on the pillory, the reaction of the public being so vehement against them, but some fared better – Daniel Defoe claimed he was pelted with flowers when pilloried after having been given a sentence for attacking unpopular practices in the church. James Peter Bossy has the dubious honour of being the last man to endure it on 24 June 1830 at the Old Bailey. It was formally abolished in 1837. 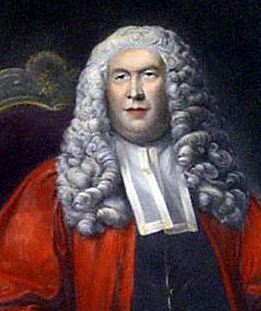 The four Commentaries on the Laws of England are now agreed to be the most influential 18th-century books on the common law of England as written by Sir William Blackstone, Solicitor General to Her Majesty, and originally published by the Clarendon Press at Oxford, 1766–1769. The work is divided into four volumes, on the rights of persons, the rights of things, of private wrongs and of public wrongs. The Rights of Persons is concerned with the relations of status in the English social structure from the King and the aristocracy to the untitled commoners. It also deals with common relationships such as husband and wife, master and servant and guardian and ward. The Rights of Things is the longest volume and deals with property. The majority of the book concerns real property which was the most valuable sort in the feudal law upon which English land law was founded. He also considers property in chattels but compared to the complex feudal background of the common law of land, in much less detail. Of Private Wrongs deals with Torts as they existed at the time. The various methods of Trial that existed at Civil Law were also dealt with in this volume as were the jurisdictions of the several courts, from the lowest to the highest. He also adds a brief chapter on Equity. Of Public Wrongs is his treatise on Criminal Law. He seeks to explain how the Criminal Laws of England were just and merciful although he frequently had to resort to the devices of assuring his reader that the laws as written were not actually enforced, and that the King’s power of pardon existed to correct any hardships or injustices. The first volume was published in February 1766. Every copy was sold within six months, and the second and third volumes, published in October 1767 and June 1768, received a similar reception. The fourth and final volume appeared in 1769, dealing with Criminal Law. With the financial success of the Commentaries Blackstone moved in 1768 from his London property in Carey Fields to No. 55 Lincoln’s Inn Fields.